Wolfgang Amadeus Mozart (baptized as Johannes Chrysostomus Wolfgangus Theophilus Mozart) (January 27, 1756 – December 5, 1791) was a prolific and celebrated composer of Classical music. His enormous output of more than six hundred compositions includes works that are widely acknowledged as pinnacles of symphonic, chamber, piano, operatic, and choral music. A legendary child prodigy, Mozart is among the most enduringly popular of European composers, and many of his works are part of the standard concert repertoire. The young Mozart toured as a child and won the patronage of both nobility and clergy in his native Austria. Unlike the music of J.S. Bach and the composers of the Baroque style, whose music was highly polyphonic and steeped in religious connotations, Mozart’s music is marked by an uncomplicated texture that would become a defining trait of the “Classical” era. This style, known as homophonic music, is characterized by a single melodic idea accompanied by a chordal underpinning, as opposed the countrapuntal conventions of the Baroque, in which multiple melodies are woven into a singular musical expression. A significant way that Mozart would heighten the drama of a musical line was by his masterly manipulation of the tonic-dominant chord progression. Particularly in his operas, he created moments of tension followed by cathartic release by exploiting the polarization of the consonant and dissonant intervals within these two chords, and also by the shifting of key centers. Equipped with these new musical devices, Mozart could explore the depths of the human psyche in ways that were revolutionary for their time. He was, in some respects, the first modern psychologist of opera, a master of creating mood, drama, and atmosphere in his operatic works. The great facility and ease with which Mozart fused music to mood was perhaps his most important contribution to music. Mozart's greatest compositions, sometimes written at breakneck pace, contain passages of revelatory beauty. Albert Einstein once remarked that while Beethoven composed his music, Mozart's music "was so pure that it seemed to have been ever-present in the universe, waiting to be discovered by the master." 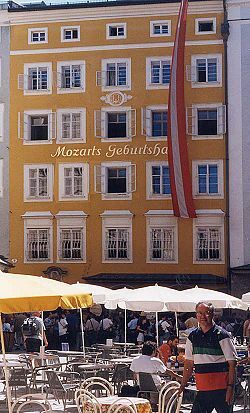 Mozart was born to Leopold and Anna Maria Pertl Mozart, in the front room of nine Getreidegasse in Salzburg, the capital of the sovereign Archbishopric of Salzburg, in what is now Austria, then part of the Holy Roman Empire. His only sibling who survived beyond infancy was an older sister: Maria Anna, nicknamed Nannerl. Mozart was baptized the day after his birth at St. Rupert's Cathedral. The baptismal record gives his name in Latinized form as Joannes Chrysostomus Wolfgangus Theophilus Mozart. Of these names, the first two refer to John Chrysostom, one of the Church Fathers, and they were names not employed in everyday life, while the fourth, meaning "beloved of God," was variously translated in Mozart's lifetime as Amadeus (Latin), Gottlieb (German), and Amadé (French). Mozart's father, Leopold, announced the birth of his son in a letter to the publisher Johann Jakob Lotter with the words "…the boy is called Joannes Chrysostomus, Wolfgang, Gottlieb." Mozart himself preferred the third name, and he also took a fancy to "Amadeus" over the years. Mozart's father, Leopold (1719–1787), was one of Europe's leading musical teachers. His influential textbook, Versuch einer gründlichen Violinschule, was published in 1756, the year of Mozart's birth (English, as A Treatise on the Fundamental Principles of Violin Playing, transl. E.Knocker; Oxford-New York, 1948). He was deputy kapellmeister to the court orchestra of the Archbishop of Salzburg, and a prolific and successful composer of instrumental music. Leopold gave up composing when his son's outstanding musical talents became evident. They first came to light when Wolfgang was about three years old, and Leopold, proud of Wolfgang's achievements, gave him intensive musical training, including instruction in clavier, violin, and organ. Leopold was Wolfgang's only teacher in his earliest years. A note by Leopold in Nannerl's music book—the Nannerl Notenbuch—records that little Wolfgang had learned several of the pieces at the age of four. Mozart's first compositions, Andante (K. 1a) and Allegro (K. 1b), were written in 1761, when he was five years old. During his formative years, Mozart made several European journeys, beginning with an exhibition in 1762, at the Court of the Elector of Bavaria in Munich, then in the same year at the Imperial Court in Vienna and Prague. 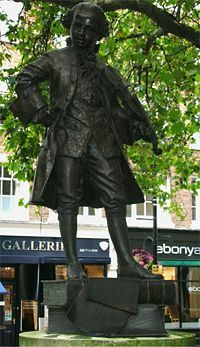 A long concert tour spanning three and a half years followed, taking him with his father to the courts of Munich, Mannheim, Paris, London (where Wolfgang Amadeus played with the famous Italian cellist Giovanni Battista Cirri), The Hague, again to Paris, and back home via Zürich, Donaueschingen, and Munich. During this trip Mozart met a great number of musicians and acquainted himself with the works of other great composers. A particularly important influence was Johann Christian Bach, who befriended Mozart in London in 1764–65. Bach's work is often taken to be an inspiration for Mozart's music. They again went to Vienna in late 1767, and remained there until December 1768. On this trip, Mozart contracted smallpox, and his healing was considered by Leopold as a proof of God's intentions concerning the child. After one year in Salzburg, three trips to Italy followed: From December 1769 to March 1771, from August to December 1771, and from October 1772 to March 1773. Mozart was commissioned to compose three operas: Mitridate Rè di Ponto (1770), Ascanio in Alba (1771), and Lucio Silla (1772), all three of which were performed in Milan. During the first of these trips, Mozart met Andrea Luchesi in Venice and G.B. Martini in Bologna, and was accepted as a member of the famous Accademia Filarmonica. A highlight of the Italian journey, now an almost legendary tale, occurred when he heard Gregorio Allegri's Miserere once in performance in the Sistine Chapel then wrote it out in its entirety from memory, only returning to correct minor errors; thus, producing the first illegal copy of this closely-guarded property of the Vatican. On September 23, 1777, accompanied by his mother, Mozart began a tour of Europe that included Munich, Mannheim, and Paris. In Mannheim he became acquainted with members of the Mannheim orchestra, the best in Europe at the time. He fell in love with Aloysia Weber, who later broke up the relationship with him. He was to marry her sister, Constanze, some four years later in Vienna. During his unsuccessful visit to Paris, his mother died (1778). 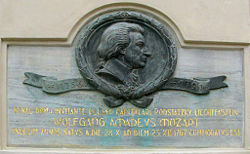 Memorial plaque dedicated to Wolfgang Amadeus Mozart in Václavské náměstí square in Olomouc (Czech Republic). Mozart in 1767, as an 11 year old boy was fleeing from Vienna due to a smallpox epidemic and wrote his Sixth Symphony in F Major in Olomouc. In 1780, Idomeneo, widely regarded as Mozart's first great opera, premiered in Munich. The following year, he visited Vienna in the company of his employer, the harsh Prince-Archbishop Colloredo. When they returned to Salzburg, Mozart, who was then Konzertmeister, became increasingly rebellious, not wanting to follow the whims of the archbishop relating to musical affairs, and expressing these views, soon fell out of favor with him. According to Mozart's own testimony, he was dismissed—literally—"with a kick in the arse." Mozart chose to settle and develop his own freelance career in Vienna after its aristocracy began to take an interest in him. On August 4, 1782, against his father's wishes, he married Constanze Weber (1763–1842; her name is also spelled "Costanze"); her father, Fridolin, was a half-brother of Carl Maria von Weber's father Franz Anton Weber. Although they had six children, only two survived infancy. Neither of these two, Karl Thomas (1784–1858) and Franz Xaver Wolfgang (1791–1844)—later a minor composer himself—married or had children who reached adulthood. Karl did father a daughter, Constanza, who died in 1833. The year 1782 was an auspicious one for Mozart's career: His opera Die Entführung aus dem Serail (The Abduction from the Seraglio) was a great success and he began a series of concerts at which he premiered his own piano concertos as director of the ensemble and soloist. During 1782–83, Mozart became closely acquainted with the work of J.S. Bach and G.F. Handel as a result of the influence of Baron Gottfried van Swieten, who owned many manuscripts of works by the Baroque masters. Mozart's study of these works led first to a number of works imitating Baroque style and later had a powerful influence on his own personal musical language, for example, the fugal passages in Die Zauberflöte (The Magic Flute) and in the Symphony No. 41. In his early Vienna years, Mozart met Joseph Haydn and the two composers became friends. When Haydn visited Vienna, they sometimes played in an impromptu string quartet. Mozart's six quartets dedicated to Haydn date from 1782–85, and are often judged to be his response to Haydn's List of string quartets by Joseph Haydn's Opus 33 set from 1781. Haydn was soon in awe of Mozart, and when he first heard the last three of Mozart's series, he told Leopold, "Before God and as an honest man I tell you that your son is the greatest composer known to me either in person or by name: He has taste, and, furthermore, the most profound knowledge of composition." During the years 1782–1785, Mozart put on a series of concerts in which he appeared as soloist in his piano concertos, widely considered among his greatest works. These concerts were financially successful. After 1785, Mozart performed far less and wrote only a few concertos. Maynard Solomon conjectures that he may have suffered from hand injuries; another possibility is that the fickle public ceased to attend the concerts in the same numbers. Mozart's life was occasionally fraught with financial difficulty. Though the extent of this difficulty has often been romanticized and exaggerated, he nonetheless did resort to borrowing money from close friends, some debts remaining unpaid even to his death. During the years 1784-1787 he lived in a lavish, seven-room apartment, which may be visited today at Domgasse 5, behind St Stephen's Cathedral; it was here, in 1786, that Mozart composed the opera Le nozze di Figaro. Mozart had a special relationship with the city of Prague and its people. The audience there celebrated the Figaro with the much-deserved reverence he was missing in his hometown Vienna. His quotation, "Meine Prager verstehen mich" ("My Praguers understand me") became very famous in the Bohemian lands. Many tourists follow his tracks in Prague and visit the Mozart Museum of the Villa Bertramka where they can enjoy a chamber concert. In the later years of his life, Prague provided Mozart with many financial resources from commissions. In Prague, Don Giovanni premiered on October 29, 1787, at the Theatre of the Estates. Mozart wrote La clemenza di Tito for the festivities accompanying Leopold II, Leopold II's coronation in November 1790; Mozart obtained this commission after Antonio Salieri had allegedly rejected it. Mozart's final illness and death are difficult topics for scholars, obscured by romantic legends and replete with conflicting theories. Scholars disagree about the course of decline in Mozart's health—particularly at what point (or if at all) Mozart became aware of his impending death and whether this awareness influenced his final works. The romantic view holds that Mozart declined gradually and that his outlook and compositions paralleled this decline. In opposition to this, some present-day scholars point out correspondence from Mozart's final year indicating that he was in good cheer, as well as evidence that Mozart's death was sudden and a shock to his family and friends. Mozart's attributed last words: "The taste of death is upon my lips… I feel something, that is not of this earth." The actual cause of Mozart's death is also a matter of conjecture. His death record listed "hitziges Frieselfieber" ("severe miliary fever," referring to a rash that looks like millet-seeds), a description that does not suffice to identify the cause as it would be diagnosed in modern medicine. Dozens of theories have been proposed, including trichinosis, mercury poisoning, and rheumatic fever. The practice, common at that time, of bleeding medical patients is also cited as a contributing cause. Mozart died around 1 a.m. on December 5, 1791, in Vienna. Some days earlier, with the onset of his illness, he had largely ceased work on his final composition, the Requiem. Popular legend has it that Mozart was thinking of his own impending death while writing this piece, and even that a messenger from the afterworld commissioned it. However, documentary evidence has established that the anonymous commission came from one Count Franz Walsegg of Schloss Stuppach, and that most if not all of the music had been written while Mozart was still in good health. 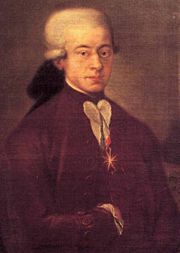 A younger composer, and Mozart's pupil at the time, Franz Xaver Süssmayr, was engaged by Constanze to complete the Requiem. However, he was not the first composer asked to finish the Requiem, as the widow had first approached another Mozart student, Joseph Eybler, who began work directly on the empty staves of Mozart's manuscript but then abandoned it. Because he was buried in an unmarked grave, it has been popularly assumed that Mozart was penniless and forgotten when he died. In fact, though he was no longer as fashionable in Vienna as before, he continued to have a well-paid job at court and receive substantial commissions from more distant parts of Europe, Prague in particular. He earned about 10,000 florins per year, equivalent to at least 42,000 U.S. dollars in 2006, which places him within the top 5 percent of late eighteenth century wage earners, but he could not manage his own wealth. His mother wrote, "When Wolfgang makes new acquaintances, he immediately wants to give his life and property to them." His impulsive largesse and spending often put him in the position of having to ask others for loans. Many of his begging letters survive but they are evidence not so much of poverty as of his habit of spending more than he earned. He was not buried in a "mass grave," but in a regular communal grave according to the 1784 laws in Austria. Though the original grave in the St. Marx cemetery was lost, memorial gravestones (or cenotaphs) have been placed there and in the Zentralfriedhof. In 2005, new DNA testing was performed by Austria's University of Innsbruck and the U.S. Armed Forces DNA Identification Laboratory in Rockville, Maryland, to determine if a skull in an Austrian Museum was actually his, using DNA samples from the marked graves of his grandmother and Mozart's niece. However, test results were inconclusive, suggesting that none of the DNA samples were related to each other. In 1809, Constanze married Danish diplomat Georg Nikolaus von Nissen (1761–1826). Being a fanatical admirer of Mozart, he (and, possibly, Constanze) edited vulgar passages out of many of the composer's letters and wrote a Mozart biography. Nissen did not live to see his biography printed, and Constanze finished it. Mozart's music, like Haydn's, stands as an archetypal example of the Classical style. His works spanned the period during which that style transformed from one exemplified by the style galant to one that began to incorporate some of the contrapuntal complexities of the late Baroque, complexities against which the galant style had been a reaction. Mozart's own stylistic development closely paralleled the development of the classical style as a whole. In addition, he was a versatile composer and wrote in almost every major genre, including symphony, opera, the solo concerto, chamber music including string quartet and string quintet, and the piano sonata. While none of these genres were new, the piano concerto was almost single-handedly developed and popularized by Mozart. He also wrote a great deal of religious music, including mass masses; and he composed many dances, divertimenti, serenades, and other forms of light entertainment. The central traits of the classical style can all be identified in Mozart's music. Clarity, balance, and transparency are hallmarks, though a simplistic notion of the delicacy of his music obscures the exceptional and even demonic power of some of his finest masterpieces, such as the Piano Concerto in C minor, K. 491, the Symphony in G minor, K. 550, and the opera, Don Giovanni. The famed writer on music, Charles Rosen, has written (in The Classical Style): "It is only through recognizing the violence and sensuality at the center of Mozart's work that we can make a start towards a comprehension of his structures and an insight into his magnificence. In a paradoxical way, Schumann's superficial characterization of the G minor Symphony can help us to see Mozart's daemon more steadily. In all of Mozart's supreme expressions of suffering and terror, there is something shockingly voluptuous." Especially during his last decade, Mozart explored chromatic harmony to a degree rare at the time. The slow introduction to the "Dissonant" Quartet, K. 465, a work that Haydn greatly admired, rapidly explodes a shallow understanding of Mozart's style as light and pleasant. From his earliest years Mozart had a gift for imitating the music he heard; since he traveled widely, he acquired a rare collection of experiences from which to create his unique compositional language. When he went to London as a child, he met J.C. Bach and heard his music; when he went to Paris, Mannheim, and Vienna, he heard the work of composers active there, as well as the spectacular Mannheim orchestra; when he went to Italy, he encountered the Italian overture and the opera buffa, both of which were to be hugely influential on his development. Both in London and Italy, the galant style was all the rage: Simple, light music, with a mania for cadencing, an emphasis on tonic, dominant, and subdominant to the exclusion of other chords, symmetrical phrases, and clearly articulated structures. This style, out of which the classical style evolved, was a reaction against the complexity of late Baroque music. Some of Mozart's early symphonies are Italian overtures, with three movements running into each other; many are "homotonal" (each movement in the same key, with the slow movement in the tonic minor). Others mimic the works of J.C. Bach, and others show the simple rounded binary forms commonly being written by composers in Vienna. As Mozart matured, he began to incorporate some features of Baroque styles into his music. For example, the Symphony No. 29 in A Major K. 201 uses a contrapuntal main theme in its first movement, and experimentation with irregular phrase lengths. Some of his quartets from 1773 have fugal finales, probably influenced by Haydn, who had just published his opus 20 set. The influence of the Sturm und Drang (Storm and Stress) period in German literature, with its brief foreshadowing of the Romantic era to come, is evident in some of the music of both composers at that time. Over the course of his working life, Mozart switched his focus from instrumental music to operas, and back again. He wrote operas in each of the styles current in Europe: Opera buffa, such as The Marriage of Figaro, Don Giovanni, or Così fan tutte, and opera seria, such as Idomeneo; and Singspiel, of which Die Zauberflöte is probably the most famous example by any composer. In his later operas, he developed the use of subtle changes in instrumentation, orchestration, and tone color to express or highlight psychological or emotional states and dramatic shifts. Here his advances in opera and instrumental composing interacted. His increasingly sophisticated use of the orchestra in the symphonies and concerti served as a resource in his operatic orchestration, and his developing subtlety in using the orchestra to psychological effect in his operas was reflected in his later non-operatic compositions. Mozart's legacy to subsequent generations of composers (in all genres) is immense. Many important composers since Mozart's time have expressed profound appreciation of Mozart. Rossini averred, "He is the only musician who had as much knowledge as genius, and as much genius as knowledge." Ludwig van Beethoven's admiration for Mozart is also quite clear. Beethoven used Mozart as a model a number of times: For example, Beethoven's Piano Concerto No. 4 in G major demonstrates a debt to Mozart's Piano Concerto in C major, K. 503. A plausible story—not corroborated—regards one of Beethoven's students who looked through a pile of music in Beethoven's apartment. When the student pulled out Mozart's A major Quartet, K. 464, Beethoven exclaimed "Ah, that piece. That's Mozart saying, 'here's what I could do, if only you had ears to hear!'" Beethoven's own Piano Concerto No. 3 in C minor is an obvious tribute to Mozart's Piano Concerto No. 24 in C minor, and yet another plausible—if unconfirmed—story concerns Beethoven at a concert with his sometime-student Ferdinand Ries. As they listened to Mozart's Piano Concerto No. 24, the orchestra reached the quite unusual coda of the last movement, and Beethoven whispered to Ries: "We'll never think of anything like that!" Beethoven's Quintet for Piano and Winds is another obvious tribute to Mozart, similar to Mozart's own quintet for the same ensemble. Beethoven also paid homage to Mozart by writing sets of theme and variations on several of his themes: For example, the two sets of variations for cello and piano on themes from Mozart's Magic Flute, and cadenzas to several of Mozart's piano concertos, most notably the Piano Concerto No. 20 K. 466. A famous legend asserts that, after the only meeting between the two composers, Mozart noted that Beethoven would, "give the world something to talk about." However, it is not certain that the two ever met. Tchaikovsky wrote his Mozartiana in praise of Mozart; and Mahler's final word was alleged to have been simply, "Mozart." The theme of the opening movement of the Piano Sonata in A major K. 331 (itself a set of variations on that theme) was used by Max Reger for his Variations and Fugue on a Theme of Mozart, written in 1914, and among Reger's best-known works. In addition, Mozart received outstanding praise from several fellow composers, including Frédéric Chopin, Franz Schubert, Peter Ilich Tchaikovsky, Robert Schumann, and many more. Mozart has remained an influence in popular contemporary music in varying genres ranging from Jazz to modern Rock and Heavy metal. An example of this influence is the jazz pianist Chick Corea, who has performed piano concertos of Mozart and was inspired by them to write a concerto of his own. In the decades after Mozart's death there were several attempts to catalogue his compositions, but it was not until 1862 that Ludwig von Köchel succeeded in this enterprise. Many of his famous works are referred to by their Köchel catalogue number; for example, the Piano Concerto in A major (Piano Concerto No. 23) is often referred to simply as "K. 488" or "KV. 488." The catalogue has undergone six revisions, labeling the works from K. 1 to K. 626. Mozart is unusual among composers for being the subject of an abundance of legend, partly because none of his early biographers knew him personally. They often resorted to fiction in order to produce a work. Many myths began soon after Mozart died, but few have any basis in fact. An example is the story that Mozart composed his Requiem with the belief it was for himself. Sorting out fabrications from real events is a vexing and continuous task for Mozart scholars, mainly because of the prevalence of legend in scholarship. Dramatists and screenwriters, free from responsibilities of scholarship, have found excellent material among these legends. An especially popular case is the supposed rivalry between Mozart and Antonio Salieri, and, in some versions, the tale that it was poison received from the latter that caused Mozart's death; this is the subject of Aleksandr Pushkin's play Mozart and Salieri, Nicolai Rimsky-Korsakov's opera Mozart and Salieri, and Peter Shaffer's play Amadeus. The last of these has been made into a feature-length film of the same name. Shaffer's play attracted criticism for portraying Mozart as vulgar and loutish, a characterization felt by many to be unfairly exaggerated, but in fact frequently confirmed by the composer's letters and other memorabilia. For example, Mozart humorously wrote canons on the words "Leck mich im Arsch" as party pieces for his friends. The Köchel numbers of these canons are 231 and 233. Another debate involves Mozart's alleged status as a kind of superhuman prodigy, from childhood right up until his death. While some have criticized his earlier works as simplistic or forgettable, others revere even Mozart's juvenilia. In any case, several of his early compositions remain very popular. The motet Exultate, jubilate (K. 165), for example, composed when Mozart was seventeen years old, is among the most frequently recorded of his vocal compositions. It is also mentioned that around the time when he was five or six years old, he could play the piano blindfolded and with his hands crossed over one another. Benjamin Simkin, a medical doctor, argues in his book, Medical and Musical Byways of Mozartiana, that Mozart had Tourette syndrome. However, no Tourette syndrome expert, organization, psychiatrist, or neurologist have stated that there were sociological and cultural aspects of Tourette syndrome since there was credible evidence that Mozart had this syndrome. Several have stated now that they do not believe there is enough evidence to substantiate the claim. Milos Forman’s 1984 motion picture, Amadeus, based on the play by Peter Shaffer, won eight Academy Awards and was one of the year’s most popular films. While the film did a great deal to popularize Mozart’s work with the general public, it has been criticized for its historical inaccuracies, and in particular for its portrayal of Antonio Salieri’s intrigues against Mozart, for which little historical evidence can be found. On the contrary, it is likely that Mozart and Salieri regarded each other as friends and colleagues. It is well documented, for instance, that Salieri frequently lent Mozart musical scores from the court library, that he often chose compositions by Mozart for performance at state occasions, and Salieri taught Mozart's son, Franz Xaver. The idea that he never revised his compositions, dramatized in the film, is easily dismissed by even a cursory examination of the autograph manuscripts, which contain many revisions. Mozart was a studiously hard worker, and by his own admission his extensive knowledge and abilities developed out of many years' close study of the European musical tradition. In fairness, Schaffer and Forman never claimed that Amadeus was intended to be an accurate biographical portrait of Mozart. Rather, as Shaffer reveals on the DVD release of the film, the dramatic narrative was inspired by the biblical story of Cain and Abel—one brother loved by God and the other scorned. Musicologist Alfred Einstein, the biographer of Mozart and twentieth century editor of the Köchel Catalog, is quoted as saying, "Mozart is the greatest composer of all. Beethoven created his music, but the music of Mozart is of such purity and beauty that one feels he merely found it—that it has always existed as part of the inner beauty of the universe waiting to be revealed." In his travels, Mozart acquired some competence in many languages: as many as fifteen, by some reports. In 1770, Mozart was awarded the Cross of the Order of the Golden Spur by Pope Clement XIV. Mozart was much taken by the sound of Benjamin Franklin's glass harmonica, and composed two works for it: An Adagio in C and an Adagio and Rondo for armonica, flute, oboe, viola, and cello (K. 617), both composed in 1791, after he heard the instrument played by the virtuoso Marianne Kirchgaessner. He started a third piece, of which only the first few bars were completed. Recordings of Mozart's music have sold more copies than any other composer. ↑ Arthur I. Miller, "A Genius Finds Inspiration in the Music of Another," New York Times, January 31, 2006. ↑ BBC News, BBC World Service article. Retrieved June 16, 2008. ↑ Penguin Guide to Classical Compact Discs. ↑ Daniel Publishing, Did Mozart Have Tourette Syndrome? Retrieved June 16, 2008. ↑ School Behavior, Famous People With Tourette Syndrome and/or Obsessive Compulsive Disorder. Retrieved June 16, 2008. Braunbehrens, Volkmar. Mozart in Vienna: 1781-1791. Timothy Bell Trans. HarperPerennial, 1986. ISBN 00609974052. Davenport, Marcia. Mozart. New York: C. Scribner's Sons, 1932. Deutsch, Otto Erich. Mozart: A Documentary Biography. Eric Blom et al. Trans. Stanford University Press, 1965. Eisen, Cliff, and Simon P. Keefe (eds.). The Cambridge Mozart Encyclopedia. Cambridge University Press, 2006. ISBN 0-521-85659-0. Greither, Aloys. Wolfgang Amadé Mozart. Rowohlt Taschenbuch Verlag GmbH, 1962. Gutman, Robert W. Mozart: A Cultural Biography. Random, 2001. ISBN 015100482X. Hershel, Jack. A Listener's Guide to Mozart's Music. Vantage, 1997. ISBN 0553123089. Massimo, Mila. Lettura delle Nozze di Figaro. Einaudi, 1979. ISBN 8806189379. Rayner, Mark, The Amadeus Net. ENC, 2005. ISBN 0975254014. Robbins, Gregory Allen. Mozart & Salieri, Cain & Abel: A Cinematic Transformation of Genesis 4. Retrieved June 16, 2008. Robbins, H.C. 1791: Mozart's Last Year. Landon, Thames & Hudson, 1988. ISBN 0500281076. Sadie, Stanley (ed.). Mozart and his Operas. St. Martin's, 2000. ISBN 031224410X. Solomon, Maynard. Mozart: A Life. Harper, 1996. ISBN 0060926929. Till, Nicholas. Mozart and the Enlightenment. Faber, Norton, 1992. ISBN 0571161693. All links retrieved December 4, 2014. 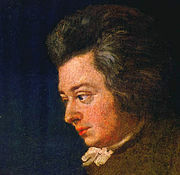 A Profile of Amadeus Mozart from Aaron Green, guide to Classical Music at About.com. 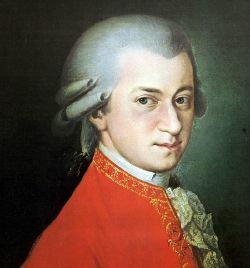 WAMozartFan.com The Wolfgang Amadeus Mozart Educational Fanpage - resource for students, teachers and music lovers. IMSLP - International Music Score Library Project's Mozart page. Cadenzas from the A Clarinet Concerto - Clariperu Many trancriptions from artists like Sabine Meyer, John McCaw, Charles Neidich, etc. History of "Wolfgang Amadeus Mozart"
This page was last modified on 4 December 2014, at 18:17.